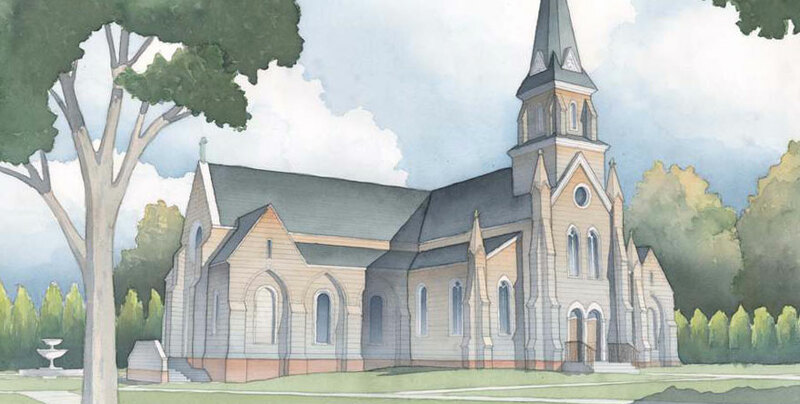 Eastern Christian "Introduction to the Liturgy"
Earlier this month, we showed to our readers the design of McCrery Architects for Saint Mary Help of Christians Church in Aiken, South Carolina. 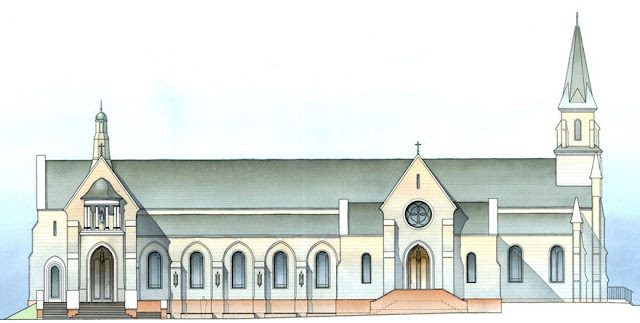 Today I wished to share with you another new project, this one a bit different insofar as it involves incorporating an existing historical structure, but one which has become too small for the parish congregation. The church in question is Holy Cross Church in Rumson, New Jersey. Needless to say, working with an existing structure leads to some interesting challenges. 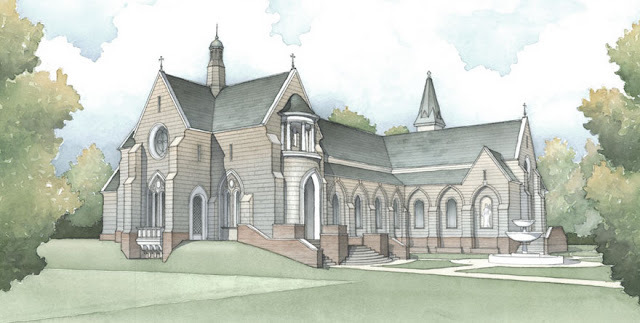 This project is for an addition to and transformation of an historic wood-frame shingled church building in historic Rumson, New Jersey. Built in 1885 to the designs of Charles Keely, the current church is quite small and will be expanded by means of transept additions and extension of the nave. The interior will be turned 180 degrees so as to orient the Mass. Before we proceed with the watercolours, a brief pause on this little abstract. You will note the interesting detail here in the last sentence: "The interior will be turned 180 degrees so as to orient the Mass." I am sure there will be some discussion as to whether this literal geographic orienting is strictly necessary given that the symbolic representation of a "liturgical East" was to eventually became so common in the Latin West; nonetheless, it is certainly laudable in its own right that such a desire exists to see the Eastwardness of liturgical prayer restored and it would seem evident that the intent is to indeed celebrate the sacred liturgy to the East, liturgically and geographically. Whatever one's position on literal vs. symbolic expressions of Eastwardness in liturgical prayer, this is surely a wonderful thing. The original Eastern entrance to the church now becomes a sacristy entrance. 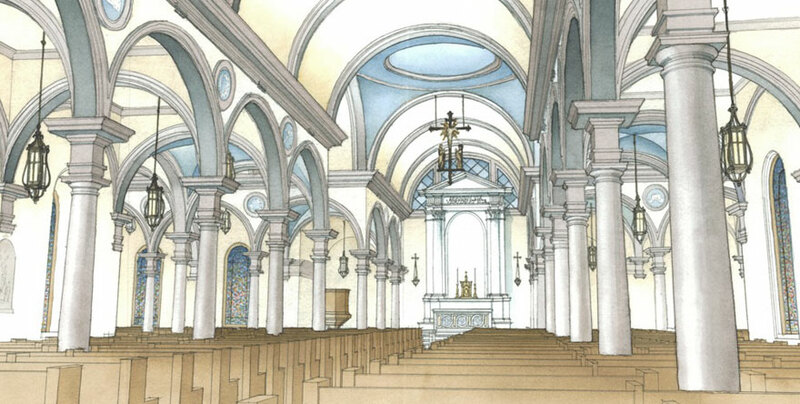 Transepts have been added to each side, giving the church a cruciform shape. Two points will likely be the source of some discussion amongst our readers. 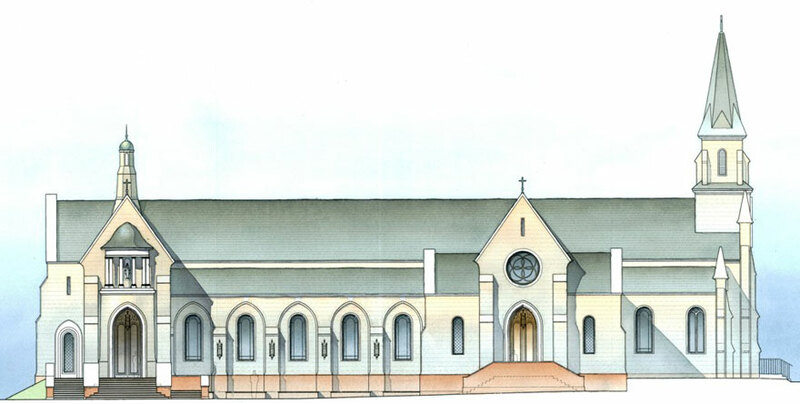 One is the placement of the original spire in the context of the new design. 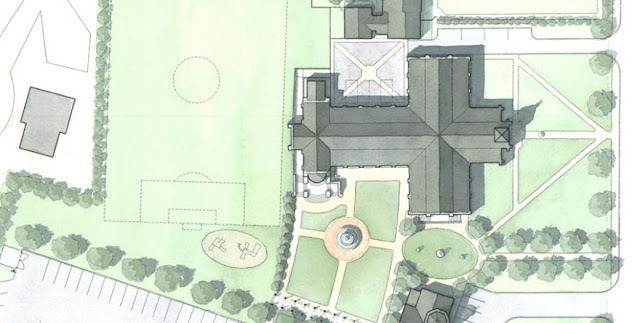 For my own part, I wonder if it should ideally be moved given the re-orientation of the church; perhaps to the axis where the transepts meet the nave -- of course, this is easy enough to suggest but obviously there is a cost which goes with this suggestion and likely not an insignificant one. Here too we can perhaps return to the question about literal vs. symbolic Eastwardness. Were the original entrance and sanctuary placement to be maintained, evidently the spire would be able remain within its original context at the entrance of the church. Doing this would mean sacrificing the literal Eastwardness of the altar and sanctuary of course -- which, given the tradition of symbolic, liturgical Eastwardness as it developed in the Latin rite is fine all things considered -- but on the other hand, there may be other considerations driving this re-configuration. The second aspect which I am sure will be the source of some discussion is the fact that the exterior has a sort of gothic quality, while the interior is more Italianate. 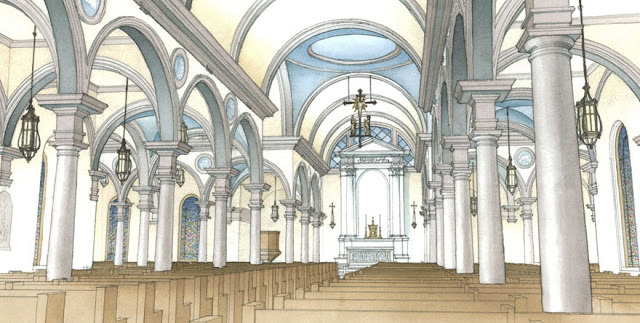 However, I would note that if you look at the exterior and the interior of the present church, you will see that this is not the result of a present design decision, but is rather a continuation of the existing historical design.